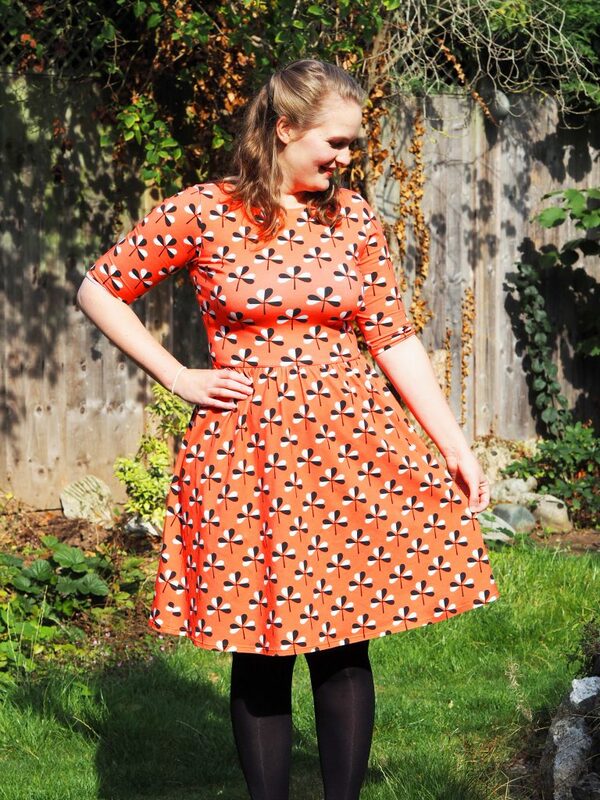 Jenny from The Wardrobe Architect has shared her latest LSABlogSquad make today! 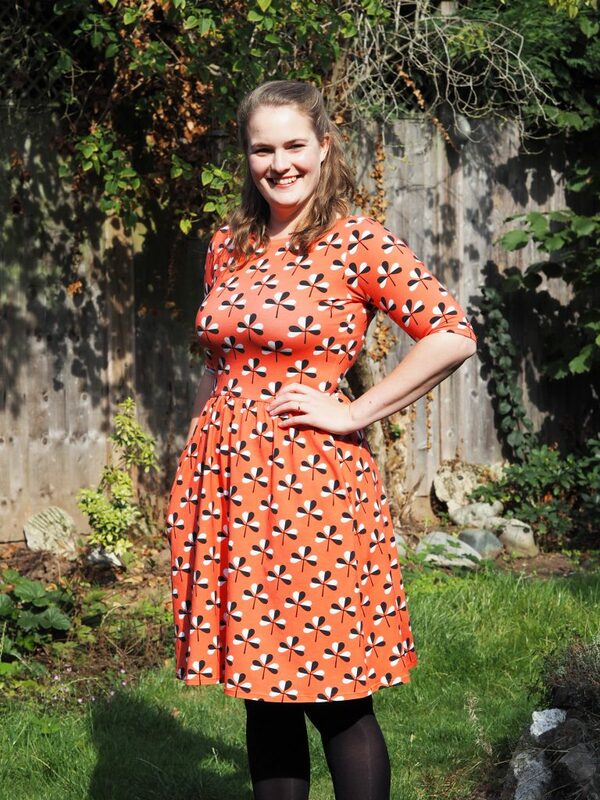 She made the Moneta dress out of our Albstoffe organic jersey. I was lucky enough to see the real thing (and the lovely Jenny) in person and it is just beautiful! She did a great job! I was lucky enough to get a ticket to the Sewing Weekender at the end of August and wanted a project that would be simple enough to sew whilst chatting. 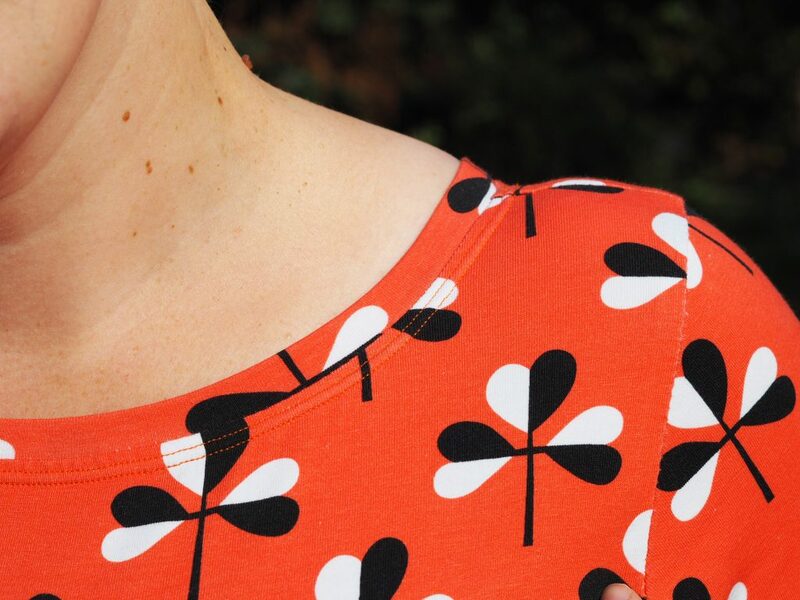 I picked this lovely coral/red clover print jersey from the new Albstoffe fabrics and thought it would be perfect for a Colette Moneta dress. 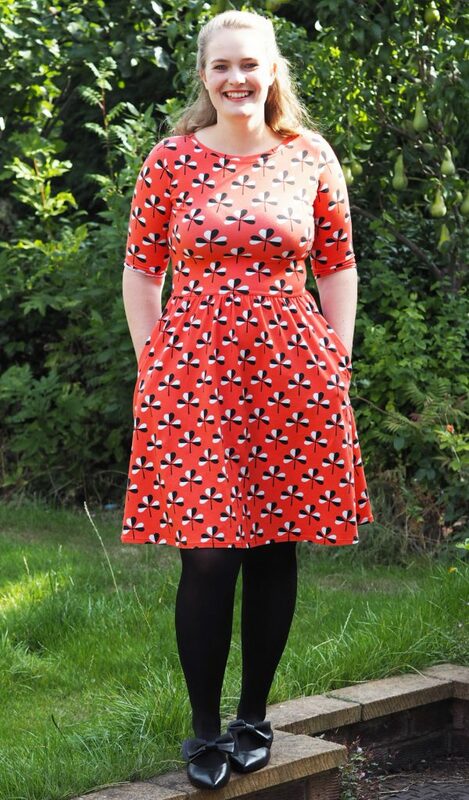 I had not made the Moneta before but have seen a huge amount of lovely versions around, it’s a popular pattern for a reason! It was very simple to sew and a really satisfying make. I added a neckband to mine, which was an easy addition. The pattern instructions say to turn under and topstitch the neckline, but I had read some reviews that said it gaped a little doing that method. I cut a length of fabric for the neckband and stretched it around the neckline with my fingers to determine the length. I then stitched it along the short edges, wrong sides together, to form a loop and pinned it to the neck edge to fit. It has raised the neckline doing a neckband, but I like the additional security! I was a bit worried about doing the clear elastic gathering for the waistband of the skirt, as I had previously messed that up on my Colette Wren dress. However, i followed the instructions and it turned out to be perfect first time. I think it is actually a really good method of gathering the skirt and it feels really secure to wear. In terms of fit, I cut the pattern out about 2 years ago when I was quite a bit thinner, so it is a little tight across the bodice! The fabric has a really good recovery though and can handle the extra stretching really well! The fabric is AMAZING! 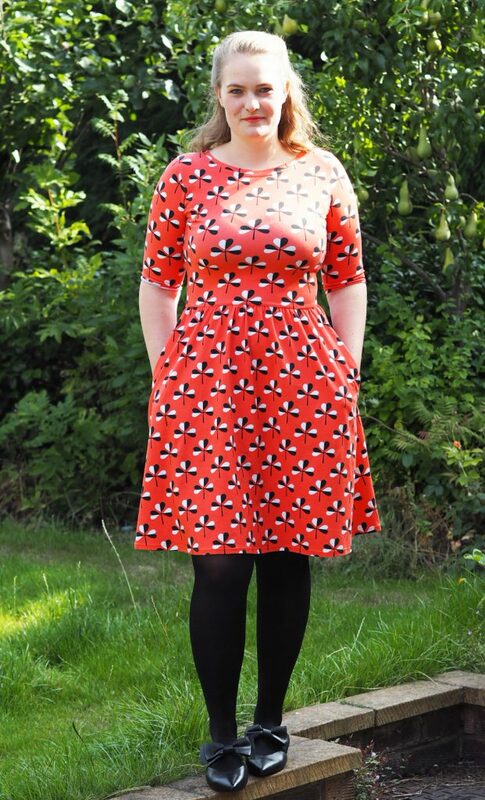 It got a lot of compliments at the Sewing Weekender because it is so soft and stretchy and the colours are so vivid! It was really easy to sew with, the print is perfectly on grain and it feels lovely to work with. I think the weight of the jersey is perfect for the Moneta, it has enough structure to hold the shape of the skirt and is super stretchy for the bodice. 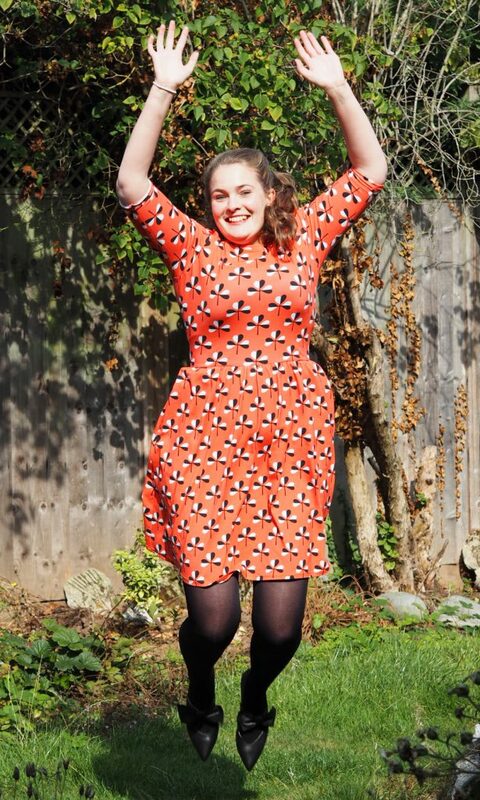 I can’t believe I haven’t made the Moneta dress before, I definitely want to make more very soon! There are a lot of other jerseys in the Like Sew Amazing shop that I think would be perfect, as well as a couple more Albstoffe ones. This project turned out so well, I’m really pleased with it and I think it is the perfect pattern and fabric combination!